The British Gazette » Binding one’s successor. Above, the Trojan Horse, the vehicle used in that most famous of surprise military strikes! Today, our dearly beloved Comrade Corbyn will make a speech. In support of the UK remaining in the EU. The British Gazette therefore take it upon itself to deliver some home truths to Comrade Corbyn. Well someone has to, as such as Mr Chuka Umunna is not going to! Firstly, we would refer Comrade Corbyn to the letter that many British Gazette readers will be sending to the Chief Constables of the police forces where they live together with the Chameleon’s taxpayer funded propaganda statement. Having read this Comrade Corbyn hopefully will realise that attempting to bind a future parliament is a SERIOUS criminal offence! Far more so than being late sending in one’s tax return! Secondly: that the UK may well have a vote at what the Europhiles like to call “the European table” but it is a MINORITY vote. This means that the UK can and is regularly outvoted and therefore is forced to accept laws that it does not like! This of course explains why Comrade Corbyn has been so quiet of late. It is precisely because such as Frau Doktor Merkel pursues policies that Comrade Corbyn does not like! 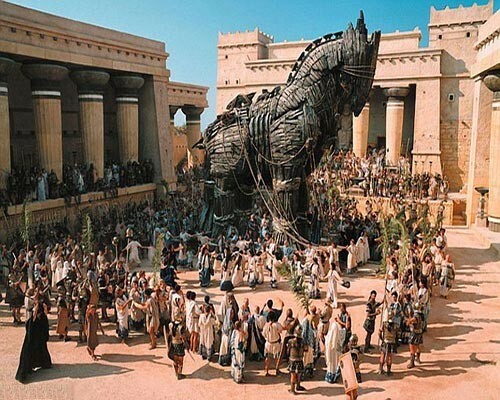 The reason why we have used the image of the Trojan Horse is this is EXACTLY how the EU works! Subterfuge and deception. Putting something in place that is not quite what it appears to be! Like a Trojan horse, or maybe a Panamanian registered exempt company incorporated with bearer shares and nominee directors? But then Comrade Corbyn is not the man to ask about such entities. Maybe the man sitting opposite Comrade Corbyn in the Commons is more knowledgeable on this particular subject?